Anyway, thin cut boneless pork loin chops with Weber's Steak and Chop seasoning. 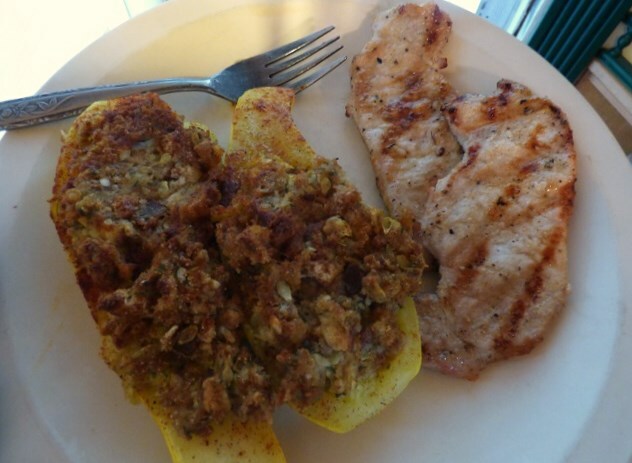 Stuffed yellow squash. These were done with stuffing mix (heresy! ), but we've done them before with homemade. We par boil first to get the squash partially done, then carve out the seeds and add some of them back to the stuffing. Fill squash and top with a pat of butter, salt, pepper, and smoked paprika. Cook indirect until the top of the stuffing starts to get a crust. 26 years specializing in food and food styling.